Here you can discuss the technical ins and outs of the Prius v and related hybrid components. Want to have the best looking and running Prius v around? Having trouble with something and need help from others? Post here! Here you can discuss the technical ins and outs of the Prius c and related hybrid components. Are you getting better/worse than the official 53/46 mpg in your Prius c? Track your fuel economy and share with others your experience with the Prius c's MPG. Want your new Prius c to look or feel unique amongst the crowd? This is your place to talk about it! The Prius c has a lot of new gadgets such as Entune to play with & learn. Talk about your audio and electronics mods/questions here. Averaging over/under the EPA's rated 50 MPG in your 2010, 2011, 2012, 2013, 2014, & 2015 3rd Generation Prius? Track your fuel economy and share with others your experience with the Prius' MPG. Looking to "pimp" your 2010, 2011, 2012, 2013, 2014, & 2015 3rd generation Prius, or just interested in adding performance modifications? This is the place! Whether you've got a brand spankin' new or an aging 2010, 2011, 2012, 2013, 2014, & 2015 3rd Generation Prius, you can learn how to take care of your Prius. The 3rd Generation Prius comes with lots of new electronic gadgets. Post your questions and modifications here. Covers model years 2010, 2011, 2012, 2013, 2014, & 2015. Post and share your favorite YouTube video at http://priuschat.com/video/ and it will be listed here for discussion. Discuss articles posted by PriusChat members on Prius quirks, fixes, modifications and more! Come chat about any car other than the Prius here - Hybrids especially! Anything unrelated to the Prius. Come chat. First Amendment is your friend in here. Are you a 'tree hugger'? Discuss the environmental aspects of the hybrid Prius, cars in general, & other environmental issues. 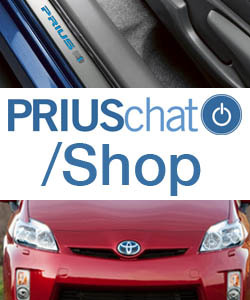 Purchase your Toyota Prius accessories through the PriusChat Shop and help support PriusChat while getting the best prices available! Sell your individual items here. Celebrate and remember the lives of PriusChat members and friends whom we have lost. Track your Prius order from the day you place your order to the day you take ownership. Wondering what the wait is like for everyone else who has ordered a Prius? Want to gloat, complain, or just share your general experience? Post it in here! Want to meet your fellow Prius Owners in person? Come discuss with owners from around the globe. Show off your Prius - post them in the Gallery or on your website, then post them in here. The new home for local Prius clubs and PriusChat groups. General information on Prius Clubs & how to start your own Local Prius Club.